Canadians Kaylin Irvine, Kali Christ and Heather McLean earned a silver medal at the world single distance championships in Inzell, Germany on Thursday. 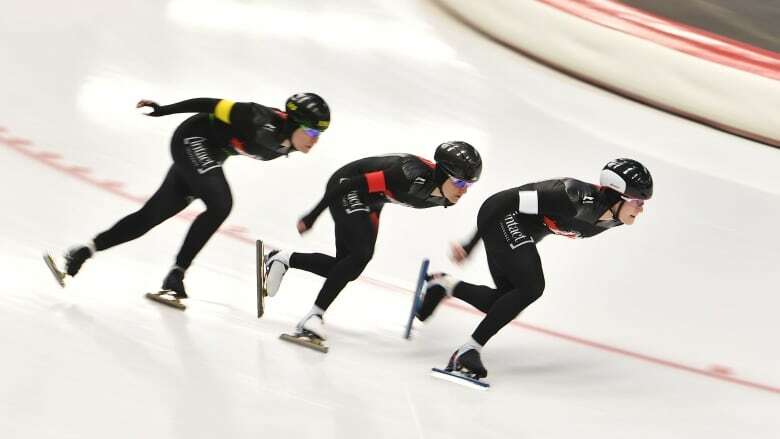 Canada raced to a silver medal in the women's team sprint at the world single distance speedskating championships Inzell, Germany on Thursday. Heather McLean of Winnipeg, Kaylin Irvine of Calgary and Kali Christ of Regina overcame a slow start to finish 0.92 seconds behind the Netherlands. Russia finished third in an event making its debut on the world championship stage. Canada entered the competition ranked fifth in the World Cup standings. I'm proud of how our team executed the race plan," said McLean. "There is plenty of room for improvement, but a world championship podium is an incredible way to get this competition started." It was the first world single distance championships medal for all three skaters. In individual action on the first day of the four-day competition, reigning Olympic silver medallist Ted-Jan Bloemen of Calgary finished fifth in the men's 5,000 metres. It matched his best previous showing at the event, set in 2016 and 2017. "For the last two months we've been working extremely hard to show up better than in the first half of the season," said Bloemen. "It was nice to see that's paying off. This was a really good effort again and we're looking forward to keep progressing into next season." Jordan Belchos of Toronto finished ninth and Graeme Fish of Moose Jaw, Sask., was 14th. Norway's Sverre Lunde Pedersen won the race. Meanwhile, Isabelle Weidemann of Ottawa finished seventh in the women's 3,000 metres. Valerie Maltais of Saguenay, Que., was 12th and Ivanie Blondin of Ottawa was disqualified. Russia's Martina Sablikova won gold.